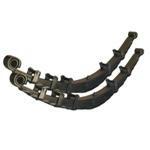 To provide smooth on-street handling and awesome axle articulation off-road, our rear leaf springs are state-of-the-art, computer-designed progressive springs. 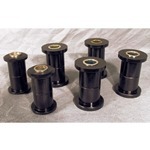 We offer a variety of rear springs to meet your specific needs. 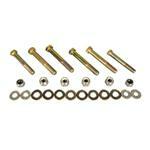 Take advantage of extra savings, buy them in kit form with bushings and U-bolts (see kits below). With years of experience, we went back to the drawing board to see if we could make a great product even better. 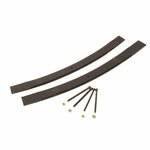 We have added two new features to our rear leaf springs that you won't find in others. First, we added a new strategically placed triple keeper system to help control axle wrap. This will dramatically improve the longevity of the spring in the most abusive environments. Next we added galvanized steel liners. This creates separation between leafs for less friction, smoother ride quality and longer spring life. 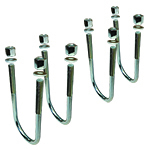 Double wrapped front spring eye for improved safety. 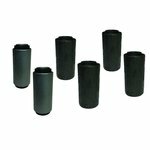 Teflon spring tip inserts for smooth quiet operation. 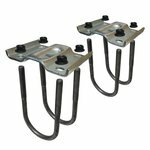 Triple front spring keepers used for anti wrap protection. Galvanized steel liners cause leaf separation for less friction, smoother ride quality and longer spring life. 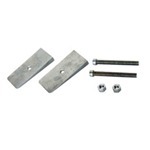 WH 7/16" center bolts hold up better under off-roading than stock 3/8" bolts. Berlin rear eye for added strength. 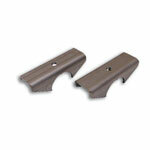 Progressive spring design for smooth road characteristics and unsurpassed travel. Each spring is shot peened for extended spring life. Now you can replace those old, worn-out rear springs or moybe those new ones that jar the fillings out of your teeth every time you hit a bump in the road. 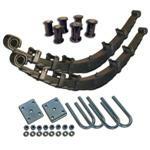 We can save you money at the same time with our rear spring kit. 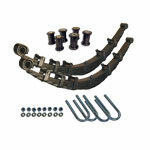 The kit includes 2 rear springs, rear spring and shackle bushings and U-bolts. 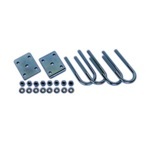 Upgrade to our Extreme Duty U-bolt and plate kit for only $40.00. 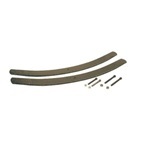 How can leaf springs with 11 leafs ride better than ones with 5 or 6 leafs? It's not the number of leafs that determine the ride, it's the spring design. 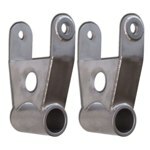 WH springs are a progressive design which means that, when you're cruising around town or down the highway, you're riding on the softer part of the spring. If you hit some hard bumps, the spring flexes, and the shorter firmer leafs are engaged. Another reason our springs provide great flex off-road and comfortable handling on the street is because there's no overload spring to get in the way of the spring flexing. The softer leafs don't bend over the end of an overload spring (this can damage ordinary springs). 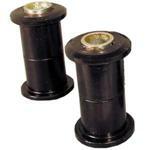 We always recommend installing bump stops to control spring compression. 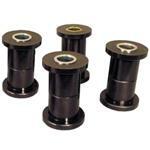 Properly spaced bump stops will also protect the shocks from bottoming out which could result in shock failure. So, which rear springs will work best for you? Ultimately, you will have to decide, but here are some guidelines: Before you pick out a set of rear springs, consider how you are going to use your Bronco. If you know you are going to load the rear heavy with tires, gas cans, tool boxes, spare parts, etc. and you like rock crawling, you may want to purchase a slightly higher lift amount for the rear. An example would be to use 2 1/2" coils with 3 1/2" leafs. 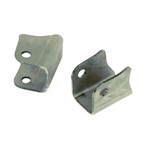 Keep in mind that WH leaf springs are designed so you can install additional leafs or remove leafs if your needs change and you want to increase or decrease the load capacity or ride height.